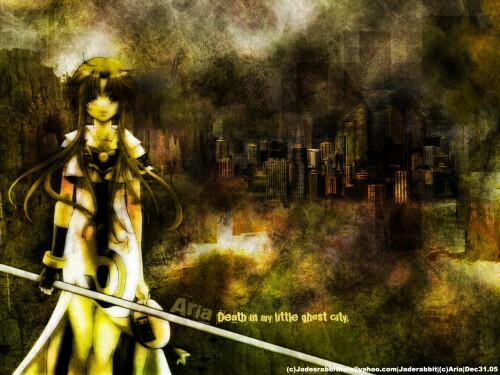 I love aria... and i love darkish gloomy wallpapers... and i said man i'd love to have a darkish aria wallpaper ^^, so after debating how i wanted it too look... since they're on the planet mars i do believe i wanted alot of yellows... but not alot of red... im not a red type of person ;) so i made this... i motion blurred the scann of her to give her a dark and alone feel. wow, how dark. really lovely job on this. i love the grunginess and the dark eerie feeling come from this is portrayed pretty well. I love the dark look to it! I don't like dark walls usually, but the detail in this is really beautiful. Is the city a stock image? It looks great! Awesome job! Interesting.Nice try but this city.....hm.....it's smthin wrong with it....it's too different from teh other bg.But really good idea. Wow! You really used textures well and created a lot of depth with the dark rich colors :D Great! I don't really need to say much other than: it rocks! I love the grunge, and the tone of color you used ... I could never imagine a dark Aria wallpaper that would work. But she looks so ghostly, in a way, nice job! Nice job on the coloring. :) I like the hues on the buildings in back. Hm...must say that dark is a bit strange for an Aria wall ^_^' but must also say that it is well done. Well, good effort, looks like a lot of work was put into this.